NOTE: More specific examples of usage can be found by clicking on "FAQ/HELP" above and going to the Help website. When you first start up CMarks, you'll see a screen similar to this. If you have only one Google account linked to your phone, you'll see your email address in the top right corner of the screen. If so, you can simply press "sync" to start (or press menu, then sync). If you have more than one Google account (e.g. a work and a home account) then click on "settings" or (menu, then settings) and simply choose the account you want to sync. 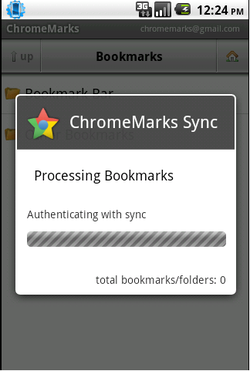 Quick Tip: You can quickly get access to your Google Chrome™ bookmarks by simply long press on the hard "search" button, if your device has one. 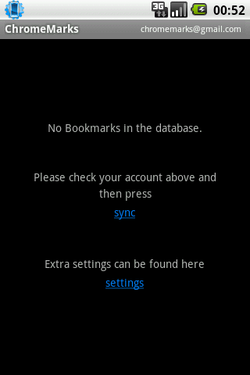 As the app syncs, you'll see a dialog informing you of the progress and the number of bookmarks and folders retrieved. 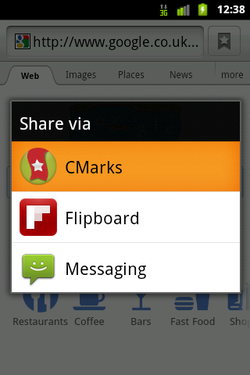 Once your bookmarks have been downloaded, CMarks will display them a folder at a time. Press the "up" button to navigate up or click on a folder to go into it. Pressing the "home" icon will take you to the top of the structure. Click on a bookmark to launch it in your default browser. Long press on a bookmark or folder to view more details about it. 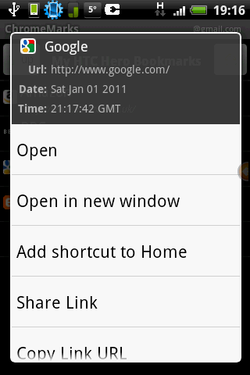 Create a home shortcut to launch this url each time you click on it. Edit the bookmark to make any changes to the name, url, folder or icon or edit a Folder to change the name or it's parent folder. If you make a change to a folder or a bookmark, the changes are sent to Google instantly and viewable in your desktop Google Chrome™ browser seconds later. 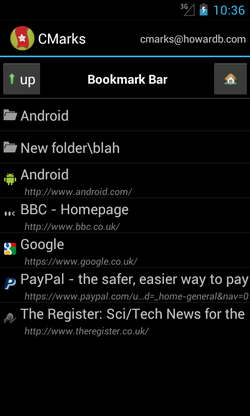 To create a new bookmark, fill in the details as required in the pop up. Google Chrome™ is quite particular about the url's it likes, so if the url is not compatible, the create button will be disabled until you correct it. If you want to retrieve the favicon for the new bookmark, click the "fetch missing icon" button and CMarks will attempt to retrieve one for you. If the website does not have an icon, a default one will be returned instead. 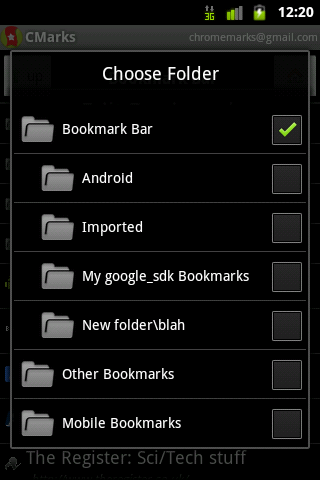 Choose the folder to place this new bookmark - by default this will be the last viewed folder. Clicking "create" will send the bookmark to Google immediately and it will be viewable in your Google Chrome™ browser seconds later. 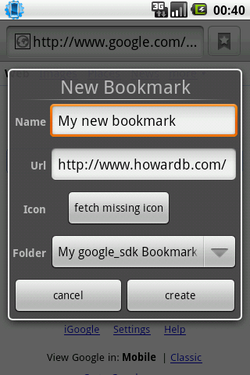 Open the folder browser to see a list of all the folders in your Google Chrome™ bookmarks structure. Navigate up and down the structure and simply click on a folder to select it.